New Delhi: Defence Minister Manohar Parrikar on Thursday launched a software to digitise records of over 12 lakh soldiers of the Indian Army. The software, ARPAN 3.0, was launched as part of the ‘Digital India Week’. Files and documents from seven records offices of the army have already been digitised, covering around 32 percent of the total soldiers. 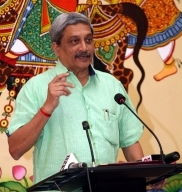 Launching the website, Parrikar said the work of digitising all records will be done in a year. “In one year, we will have a perfect website,” Parrikar said. In another year, records of all 45 record offices of the army, covering more than 12 lakh soldiers, will be digitised, he added. Accessible on the intranet connecting army stations, a website will allow soldiers access to their account information through a website through a login name and password. It will have personal details, including documentation, unit administration, salary, leave, transfer and postings, besides various reports and returns. The details can also be sent from one unit to other, if needed. Officials said kiosks will also be set at different stations to allow soldiers to check their uploaded information. It will also help in calculating pensions once the soldier retires. Army Chief General Dalbir Singh, meanwhile, said it will “enhance efficiency”. “Units and individuals will be able to access records….It will also enhance the efficiency of the record office,” he said. An army official said the software has been developed jointly by the Army Software Development Centre (ASDC) and Tech Mahindra, at a cost of Rs.1.9 crore. It is an advanced version of previous software ARPAN 2.0. An official involved in the development of the software said the transfer of records from ARPAN 2.0 format to the new version was a time-consuming process. While this initiative focuses on digitising records of the Joint Commissioned Officers and jawans, the records of around 45,000 officers have already been digitised, he said.